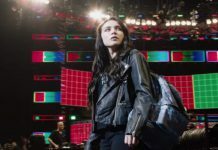 The first trailer for the upcoming movie based off WWE superstar Paige‘s life was released, earlier today. The movie, “Fighting with My Family” is inspired by the 2012 documentary The Wrestlers: Fighting with My Family, and is produced by Dwyane “The Rock” Johnson, written and directed by Stephen Merchant (The Office). The film follows the lives of the Bevis family, a family of wrestlers, as they try to work through conflicts that arise after brother and sister, Zak and Saraya, audition for WWE, but only Saraya is accepted. Florence Pugh plays the part of Paige, while fellow English actor Jack Lowden plays the role of Zak. Nick Frost makes an appearance as Paige’s dad Patrick “Rowdy Ricky Knight” Bevis, while Lena Headey takes on the spot of Paige’s mom, Julia “Sweet Saraya” Bevis. Zelina Vega makes an appearance as A.J. Lee, NXT UK wrestler Dave Mastiff can be seen briefly in the trailer, Vince Vaughn plays Hutch the WWE talent scout, and Tess Blanchard acts as Pugh’s stunt double. Of course, The Rock also stars in the film he was so excited to produce. In-ring scenes were filmed at the Staples Center in Los Angeles during Raw. The film it set to premiere next year, February. Next articleMaybe Nia Needs To Take A Step Back?